I often fantasize that when I die, my spirit will stay here long enough and be omniscient enough to know how people react and feel. I’d like to see my own funeral like Tom Sawyer and Huck Finn. First one and then another pair of eyes followed the minister’s, and then almost with one impulse the congregation rose and stared while the three dead boys came marching up the aisle, Tom in the lead, Joe next, and Huck, a ruin of drooping rags, sneaking sheepishly in the rear! They had been hid in the unused gallery listening to their own funeral sermon! Don’t worry. This isn’t a cry for help. Would she come all these miles for my funeral? Would she be able to go on? 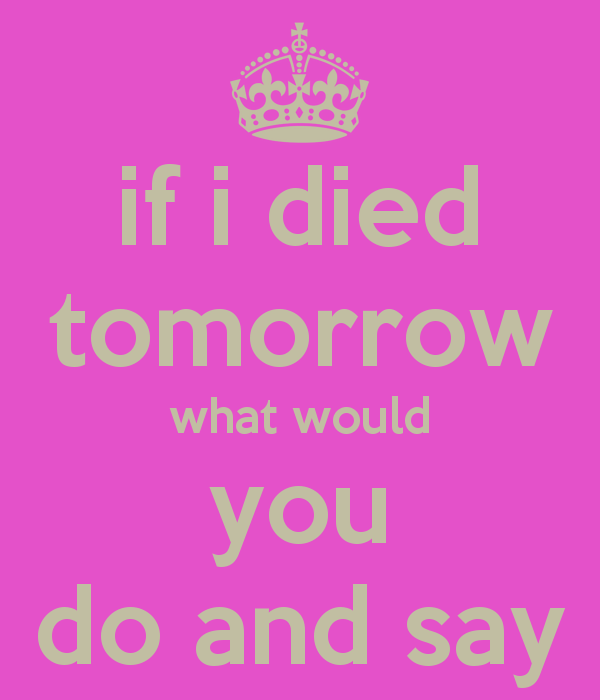 What would my funeral be like? I know where I want it to be and who I want to do it. I know what I want done with my body. Would those things happen? How long would people remember me? Why would they remember me?